Perfume days for people with a little experience. Small groups, with friendly guidance from Sarah McCartney. “One day in the studio is not enough, I need to go back soon. Best thing ever for any perfume lover!” Monique Rausch. You have morning and afternoon sessions with access to our own materials, both natural and synthetic. You’ll take away a 50ml bottle of finished fragrance*, and all your experimental blends too. You’ll smell a range of materials and learn how to blend them. 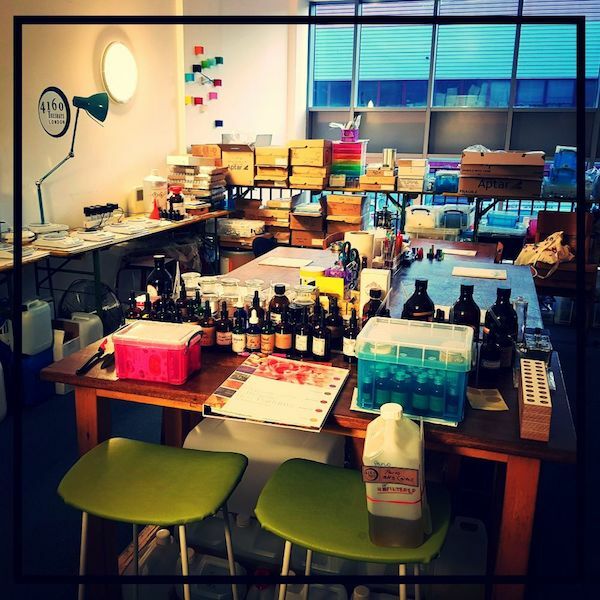 It can be quite hard work – lots to learn – but you get as much help and guidance as you need from 4160Tuesdays’ own indie perfumer, Sarah McCartney. We arrive between 10.30 and 11 for a drink and introductory chat. Some people travel a long way to get here, so we allow time for arriving and settling in. You’ll smell a carefully curated range of perfumery materials, both naturals and synthetics, and to blend them to create a wearable fragrance. We generally head off to Paulo’s cafe for all day breakfast at around 1.20, or CJ’s for Thai noodles; you can bring your lunch or get something at Tesco on the corner if you like. *The formulas are yours to do whatever you like with, and if you need more of your fragrance, you can photograph it and we’ll make it up for you. We realise that things crop up that people weren’t planning for, but our workshops sell out, and we can’t always resell spaces at short notice – although we do try. If you cancel 30 days or more before your workshop we will refund you completely. If you cancel between 14 and 28 days beforehand, we will move to you to later date. If you cancel within 14 days, you can pass your seat on to someone else, or you can spend the money on our perfume. Fair’s fair.